Here is our Great Gatsby Jazz Band, as a five piece, in action. Playing popular songs, acoustically in a garden setting. Vocals and an entertaining presentation coupled with great outfits complete the package. The best in Great Gatsby Jazz Band Hire. The Gatsby Band has been so popular in London and, in fact, all over the UK for many years. This is because Gatsby Jazz lends such an uplifting effect to so many events. Yes, it is the look of the band and the sound of the band, but more than that it is the ambience it helps create to a party, a reception and even a product promotion! 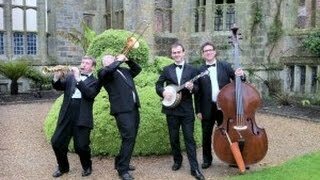 We supply our Gatsby Jazz Band all around the UK. 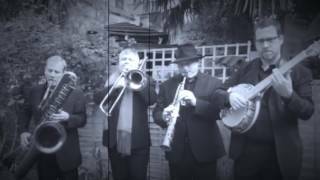 Here are some of the places we cover, and some of the other names the Gatsby Band is know as: 1920’s Jazz Band Hire London, Speakeasy Jazz Band Hire, Jazz band hire Kent, Jazz band hire Brighton, Jazz Band Hire Oxford, Jazz band Henley, New Orleans Jazz Band hire. 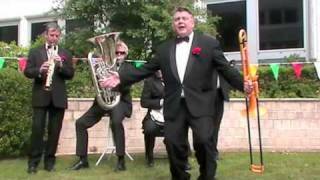 You may want New Orleans Funeral Jazz Band hire, Burlesque Band hire, Cruise ship band hire, Party Band Hire, Jazz Band Surrey Hire and Chelsea and Hampton Court Flower Show Jazz Band Hire. 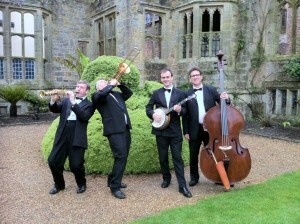 Dixieland Jazz Band Hire is here. Cruise Band Jazz is something we get asked for from time to time. More information on that here. Interesting explanation of the Gatsby Era, the parties, the music and how it all came about, as well some info on the Fitzgerald book too. Got a Xmas Party coming up? Want to hire a jazz band for Xmas? More information here. New Years Eve too! Hire jazz musicians from us and your party is guaranteed a success! For music from the Great Gatsby age, Roaring 20’s Bands, Gatsby Band London, we are here to help. New Years Eve Jazz Band Tips here. More info on Jazz Band Hire London here.